Nowadays the spam comments in blogs have become quite a serious problem for almost any blogger. There are a lot of automated solutions that try to block the automatic spam bots that visit your blog and leave a mess in the comment sections of your posts. But why should you add additional heavy load to your hosting server with very advanced spambot protection solutions that are hard to implement and configure and not always provide 100% protection when there are some very simple and still quite efficient solutions? As Google became the most popular and widely used search engine worldwide it is normal that ranking higher in the results returned when searching for something is preferred. But getting to be among the first 10 results for a given keyword or a set of keywords in Google’s results is not an easy task. The factors that determine where should your blog or website be positioned in the results are quite a lot and nobody probably except Google themselves knows them all. This is all done in order to prevent webmasters from cheating, and although that helps in some way a lot of people succeed in tricking the system and ranking higher than others. Cheating is not something that we recommend doing, because it may as well have a reverse effect and you might find yourself in Google’s site blacklist for that. One of the absolutely legal ways to improve the position of your website or blog is to increase it’s PR or Page Rank and this is done by building quality backlinks to your site. How this can be done is a matter of another discussion, but for now lets settle for a more detailed explanation of what is Google’s Page Rank and how it is being measured, along with a links to a website where you can check your current PR…. Page Rank relies on the uniquely democratic nature of the web by using its vast link structure as an indicator of an individual page’s value. In essence, Google interprets a link from page A to page B as a vote, by page A, for page B. But, Google looks at more than the sheer volume of votes, or links a page receives; it also analyzes the page that casts the vote. Votes cast by pages that are themselves “important” weigh more heavily and help to make other pages “important”. In other words, a Page Rank results from a “ballot” among all the other pages on the World Wide Web about how important a page is. A hyperlink to a page counts as a vote of support. The Page Rank of a page is defined recursively and depends on the number and PageRank metric of all pages that link to it (“incoming links”). 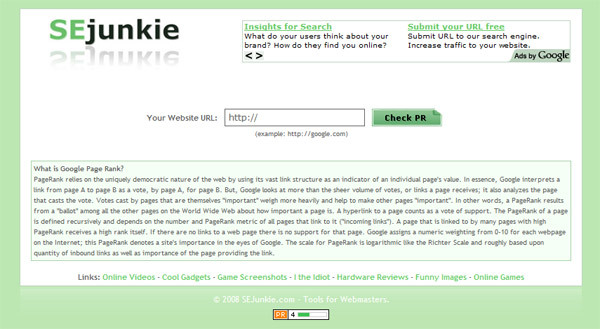 A page that is linked to by many pages with high PageRank receives a high rank itself. If there are no links to a web page there is no support for that page. Google assigns a numeric weighting from 0-10 for each webpage on the Internet; this Page Rank denotes a site’s importance in the eyes of Google. The scale for Page Rank is logarithmic like the Richter Scale and roughly based upon quantity of inbound links as well as importance of the page providing the link.